Miller House, a handsome Georgian villa built by Miller's sea-captain father, is the home of a superb new museum created by the Trust. It presents Hugh Miller's many talents - including stonemason, geologist, writer, editor and church reformer - through a variety of exhibitions, with some of the artefacts reappearing after over 20 years in storage. The fossil collection has been enhanced with several specimens on long-term loan from the national Miller collection. 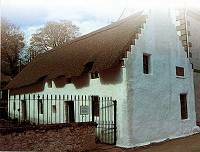 You can also visit the 17th century thatched cottage where Hugh was born in 1802. An audio tour takes you round its cobbled yard and the Scottish wild garden, then inside the building for vivid descriptions, often in Hugh's own words, of its history and of generations of his family who lived there. Via Kessock Bridge and A832, in Cromarty, 22 miles north-east of Inverness.